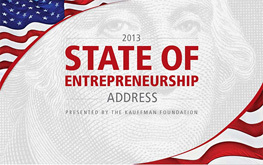 The Kauffman Foundation, in conjunction with Bloomberg Television, will present the fourth annual State of Entrepreneurship Address on February 5, 2013. The address will be given at the historic National Press Club in downtown Washington DC, just blocks from the White House. The event takes place from noon until 2:00pm. The address will be presented by Tom McDonnell the CEO and President of the Kauffman Foundation. He will discuss policy ideas for financing entrepreneurial growth. Remarks will also be made by Karen Mills the Administrator of the US Small Business Administration. Lunch and a panel discussion featuring Chance Barnett, co-founder and CEO, crowdfunder; Jeff Fagnan, partner, Atlas Venture; Donna Harris, managing director of Startup Regions, Startup America Partnership; Ramana Nanda, associate professor of Business Administration, Harvard Business School; Alan Patricof, founder and managing director, Greycroft Partners. The discussion will be moderated by Robert Litan, director of research, Bloomberg.gov, will immediately follow. If you want to hear where entrepreneurship stands in 2013 along with plans to continue fueling America’s economy with a focus on startups, then you don’t want to miss this event. Advance registration is required and you can do so here, by January 28, 2013. Find out about the state of startups everywhere else, at everywhereelse.co The Startup Conference, the largest single venue startup conference in the U.S.